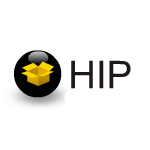 HIP is Software as a Service solution for hotels to manage a budget, perform checkbook accounting and run a perpetual inventory. It integrates completely with HotSOS, so that parts usage from HotSOS is automatically removed from inventory, and the correct parts cost is associated to the service order. This is the replacement for our old Money Minder application. Description:HOTEL Premium™ Software Suite by Execu/tech will provide your property with one complete and seamlessly integrated software solution. This "one" solution approach means efficiency for your business.You'll have more time to serve your guests instead of having to serve your computer. 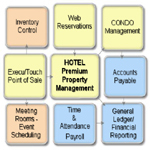 Easy Innkeeping Hotel management software designed for hotels, motels, and resorts emphasizing ease of use, speed, reliability,pricing, and integration of all aspects of property management. Designed to help you manage your reservations, analyze your marketing and financial data, and interface with a real-time online reservation system for Internet bookings.